This week's tasting features a tea from Teabook, a new tea subscription service. I imagine it's very difficult to stand out from the crowd in a market flooded with subscription services, but Teabook is trying with their 'Great tea made easy' slogan. It's all about having high quality tea on the go. I am all about carrying my tea around with me, especially as I commute to work and take the kids out for weekend activities. So for that reason I was particularly interested in Teabook. 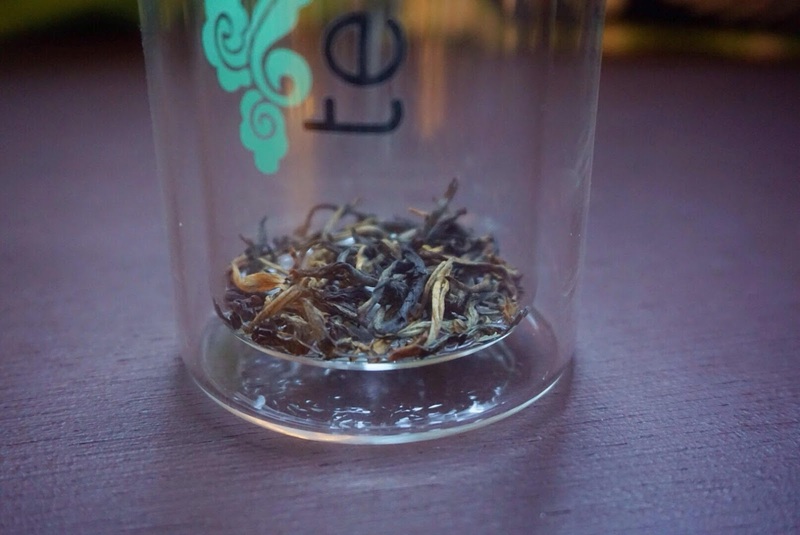 The first subscription box includes a glass tea tumbler to steep the tea and loose tea divided into single-serve packets. You add the packet of tea to the tumbler, pour water, and then go. If you are interested in learning more about the company and their philosophy you can check out their website here. I decided to start with the Dian Hong, one of my favorite Chinese black teas for everyday. There is a small amount of tea in the sealed package. I'm not worried about the amount, I'm more concerned about leaving the leaves in the water for an extended amount of time. Will it work? Leaving the leaves directly in the water as you sip is sometimes called 'grandpa style' brewing. The leaves aren't removed, and you simply add fresh hot water when you need a refill. This is a popular way to drink tea in China. My brother-in-law mentioned seeing this style of brewing when he took a trip there a few years ago. He said many people carry around plastic containers with the leaves and water together that they sip from all day. So, I added the leaves to the tumbler, poured the water, let it sit and screwed on the cap. I took the tumbler with me on my train ride (I have a commuTEAing series on Instagram if you are interested), and sipped as I rode. My whole commute is about 30 minutes, and I was surprised that the tea never became too bitter. There was definitely a bitter aftertaste, but it was slight. I actually enjoy a bit of bite from my black teas, so I didn't mind. This tea was sweet, malty and bright. A good choice for grandpa-style tea, since it doesn't have much astringency. This is a good quality tea, and the packet gives you just the right amount. A nice Dian Hong, but it doesn't beat my all time favorite from Joseph Wesley Tea. I do have a few thoughts on the glass tumbler. It is a nice vessel for grandpa-style brewing because it has a metal strainer at the top. This way you're not filtering the leaves with your teeth which makes it easier if you are on the go. 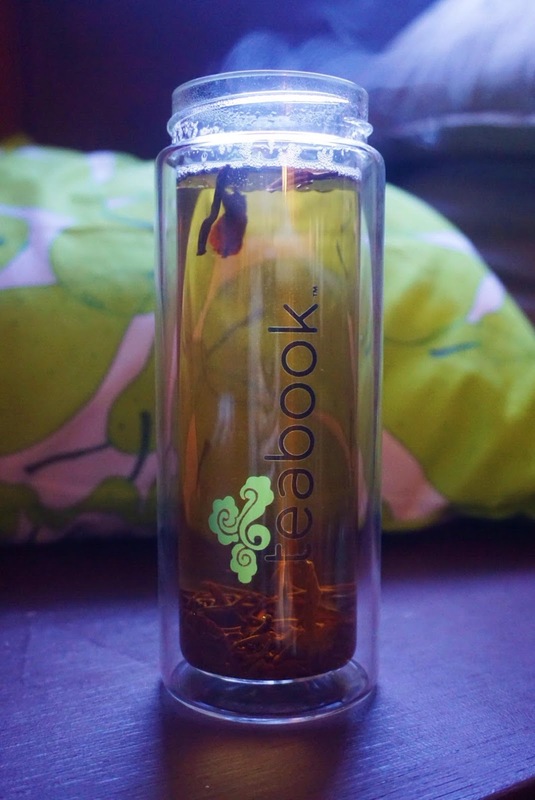 I like the double walled glass, it lets you see the leaves dancing in your tea and keeps your fingers cool. The pre-measured packets and tumbler make getting for the workday commute quite simple. I did have a few problems with this vessel though. I had a major accident the first time I brewed the tea. At 195°, the water is obviously very hot. The instructions don't mention letting the tea cool a bit before you put the top on. I was running late so I added the water, screwed on the top, and then tipped it over to see if it the seal was tight. When I tipped it over, the cap exploded off and everything came rushing out. Thankfully I did this over the sink! I've had had experiences with leaks with a different glass tumbler, which is why I wanted to test this one. I should have realized that using water this hot and screwing on the lid would cause a pressure issue. So, just be very mindful of the water temperature. I didn't have any leaky issues the second time I used the tumbler, and it worked quite well. But the third time I did experience some leaking, which was frustrating. It's a bit temperamental and I can't recommend leaving it in your bag as you are on the go. I also don't like that the top is lined in plastic. I could taste the plastic as I sipped the tea. I've had quite a few double-walled tumblers in the past, and many of them are glass all the way up and only plastic in the screw-top that you remove before drinking. I especially like this one from Aquaovo, but be careful, it is not leak-proof either! A Teabook subscription is $24.99 a month, which gets you a tea tumbler with your first order, and 18 packets of two different types of tea along with a packet of a 'special' tea. I have only tried the Dian Hong, which I quite enjoyed. Stay tuned for my experience with the other two teas in the box. 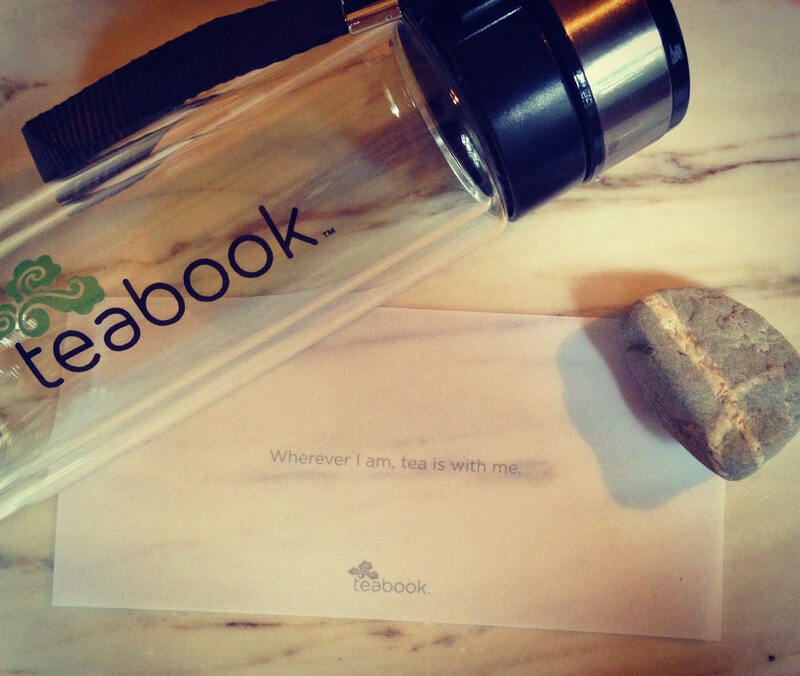 Thank you to Teabook for providing the samples! Glad you liked the post Patti! I love Upton tea, it's always fun to browse through their catalog and they have some great products. There are many, many subscription tea services out there. This one is nice because it's focused on tea 'on the go' but there are lots of others. I agree that an important part of the tea experience is the function and aesthetic of the accessories! I'll have to try your Upon tea pick as well. I always love a good Assam!